Reacting to Viv Thomas's scathing report issued earlier this week, Mathew McCarthy, prospective Assembly candidate for Neath, commented: "Under the Assembly Education minister, Leighton Andrews, the funding gap between England and Wales has grown to an unacceptable, and almost unbelievable, £604 per pupil. As we have seen, Mr. Andrews has no answers for any of the important issues, instead preferring to rant about Coco Pops and dodge questions. This time he is blaming anybody but himself for his failings. I feel it is important to bear in mind that during his term in office, basic literacy and numeracy levels among Welsh pupils have dropped significantly. Mr Andrews calls the Viv Thomas review a 'wake up call', but as with the countless other 'wake up calls' to the Labour/Plaid administration, it is one they would rather ignore until it is far too late. 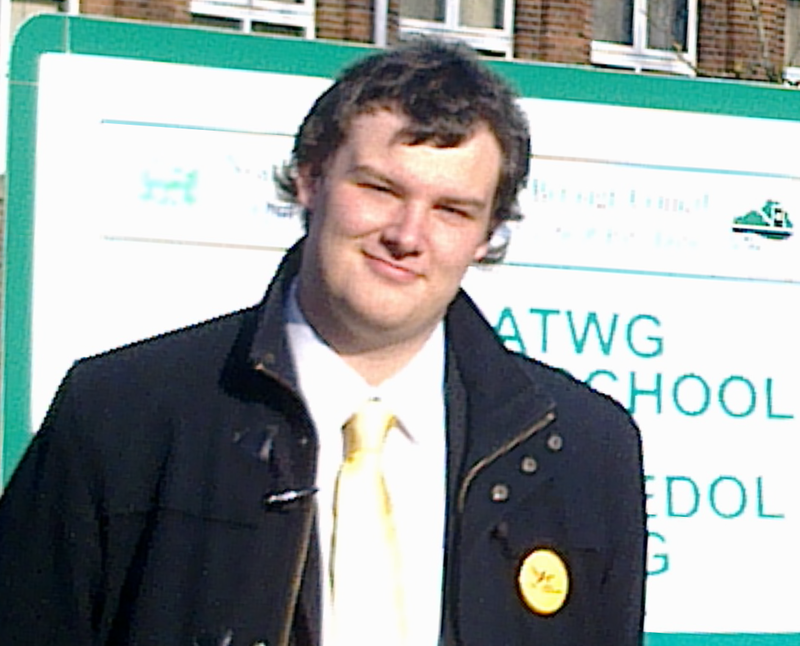 Welsh pupils deserve better, and with the Welsh Liberal Democrats and our pupil premium scheme, Welsh students can do better." "The Tories say that the Welsh economy is weak but their own policies would take Wales backwards. "Wales’ weak economy is a direct result of low levels of skills and underfunded and underperforming schools. "The Tories want to slash budgets for economic development, training and schools in Wales at the very time when these areas need to be prioritised. "Welsh Liberal Democrats will focus on tackling the skills gap and making sure that Wales is a good place to do business. We will create jobs and improve our economy by offering companies £2000 for staff training if they provide jobs to unemployed young people." As Labour and Plaid Cymru approach the end of their joint administration, Kirsty Williams, the Leader of the Welsh Liberal Democrats has renewed her attack on the record of both parties in the areas of health, education and the economy. “The joint leadership of Labour and Plaid Cymru has left Wales with a weak economy, underfunded and underperforming schools and an NHS that costs more but delivers less. It is a truly dismal record of failure in the most important areas for the people of Wales. “They spent more money on economic development than any other part of the UK, but Wales is now the poorest part of Britain and we’re getting relatively poorer. “Welsh schools were once the envy of the world. Now, Wales’ results have fallen behind England and Scotland. Little wonder when children in Wales get six hundred pounds less spent on their education. “Labour and Plaid have spent more of our money on the NHS than England, but we put up with longer waiting times. "Plaid Cymru are desperately trying to run away from their record in Government with Labour. We’ve heard of a sham marriage. Now Labour and Plaid are engaged in a sham divorce. Aberavon and Neath Liberal Democrats welcome the fact that, as a result of the coalition government's budgets, 1,890 hard-working people in Neath Port Talbot will be taken out of tax altogether and 52,700 will see their tax reduced. Responding to the UK budget, Kirsty Williams, the Leader of the Welsh Liberal Democrats said: "The tax cuts for Welsh workers announced today, taken directly from the Liberal Democrat’s election manifesto will reduce income tax by £326 for over 1.1 million Welsh workers, taking 51, 000 of the poorest workers out of income tax altogether. “Fuel duty is now a real issue for so many families, particularly in rural Wales. Labour’s proposals to increase fuel duty have rightly been scrapped and I am pleased at the further cuts announced. “It is clear that the UK government today has set out a clear plan for restoring growth in the economy. Many of the measures to boost growth and create jobs, such as the Enterprise Zones, investment in English Universities technical colleges, the holiday on business rates and the support first time buyers, will apply in England and will now need to be considered by the Welsh Government. “Wales will receive extra money as a result of these announcements and it is essential that the Welsh Government puts in place similar measures to that Wales does not get further behind. The Minister for Health and Social Services Edwina Hart AM, today admitted that the Health “system does fail people” that it does not meet cancer treatment times and that she would urge those people who are affected to ask for help. The Minister was responding to a question from South Wales West Liberal Democrat Assembly Member Peter Black, who was alerted to a constituent having to wait 26 weeks to see a clinical specialist despite being told he was on the urgent cancer treatment list. “I was shocked at Mrs Hart’s admission,” said Mr Black. “It is unacceptable that patients, who have received a cancer diagnosis are then made to wait 6 months to see a specialist and then made to wait even longer for the treatment they desperately need. “I’m sure my constituent would have felt that going to the doctor and becoming a cancer patient would be the appropriate course of action to get the treatment they require. This is a very distressing time for the patient and his family and they need to reassured that the health service is doing everything it can to help them." BBC Wales reports that there will be up to 25% fewer places at some Welsh universities this summer. The cap is to be enforced by the Higher Education Funding Council for Wales (HEFCW) to control the cost of financing student loans and bursaries. Jenny Randerson, Welsh Liberal Democrat Shadow Education Minister commented: “We understand the need to cap student numbers. However, this is very stringent and it is bad news for students who wish to study in North Wales, mature students and those from poorer backgrounds, as they would rather study closer to where they live to reduce costs." The Welsh Liberal Democrats today unveiled their economic programme designed to create jobs by tackling low skills and boost growth. The Welsh Liberal Democrats will make it easier for businesses to take on young unemployed workers by offering grants of £2,000 to raise skill levels. 5,000 of these grants would be available every year. Kirsty Williams, Leader of the Welsh Liberal Democrats, will launch the economy policy during a visit to Carillion Training Services in Cardiff. Carillion is recognised as the UK’s leading construction training organisation. • A fully funded programme to invest in modernising the Welsh economy. • Reducing the regulatory burden on small businesses. • Make the case for electrifying the Valleys Lines. • Create “wi-fi towns” to encourage tourism and conference in new areas. • Opening up procurement to smaller businesses. “Welsh Liberal Democrats will focus on creating new jobs and prosperity by investing in home-grown Welsh enterprises, by tackling the skills gap and by making sure that Wales has businesses that can compete in the modern world. We can only do this by tackling Labour’s shameful neglect of the skills agenda. “But this is just one part of our plan to create jobs by boosting the economy. Skills alone will not create the jobs needed, so we will make sure our economy is modernised by setting up a Jobs and Growth Innovation Programme, which will support projects that will create jobs by modernising the economy such as increasing the number of patents, establishing business mentoring schemes and upgrading old manufacturing sites for new jobs. “The Labour-Plaid Government has spent more money on economic development than any other part of the UK, but Wales is the poorest part of the United Kingdom and we’re still falling further behind. We have the poorest regional economy in the UK and our skills levels have been condemned by leading international businessmen. The Welsh Liberal Democrat Assembly Member for South Wales West, Peter Black has urged the Minister for Heritage to review the decision not to list a historic building in Port Talbot. The Royal Buildings and Custom House in Port Talbot is going to be demolished by a Housing Association to make way for affordable flats. A previous decision not to list the historic buildings can be revisited by the Minister as new evidence has come to light. “These buildings are a part of Port Talbot’s heritage as an industrial town” said Mr. Black, "It is essential that we retain this part of the area’s identity. "All pre-1919 buildings are now regarded as part of our national heritage and therefore historic, so it is right that they are protected. The need for additional homes can be met within these buildings through sympathetic renovation, which has occurred in listed buildings the length and breadth of Wales. I welcome the Minister's agreement to review the decision, but must stress the urgency of the situation as the developers have already begun to clear the buildings for demolition." Aberavon Liberal Democrat Assembly Candidate Helen Ceri-Clarke added: “The Talbot family built these historic buildings to office their industrial operations. They are a part of the history of the area and indeed, the reason the area has its name. It would be a travesty if these buildings were to disappear altogether. Co-chair of the Liberal Democrat Parliamentary Committee on Business, Innovations and Skills, Lorely Burt, together with her parliamentary colleagues MP for Cheadle, Mark Hunter and MP for Bradford East, David Ward has been leading a campaign to prevent the phasing out of cheques. “Last year alone there were over one billion cheque transactions which shows just how widely used this form of payment still is. For tradesmen and small business, cheques are an essential method of payment as other methods can be expensive to administer. “For many older or vulnerable people, particularly pensioners or those who are housebound, cheques are a necessary alternative to keeping wads of cash under their pillow and leaving themselves at a greater risk of theft and burglary. http://www.libdemvoice.org/roundup-conference-on-libdemvoice-23419.html including a Podcast of an important Q&A on the Internet, security and democracy. Frank Little writes: The big debate today as far as the media are concerned was F5, "Updating the NHS: Personal and Local". Although the GP-based reorganisation affects only England, perhaps some comments are in order. The feeling in the hall was of opposition to privatisation,by the front or back door, resistance to reorganisation of the NHS for the sake of it (that's familiar to us in Wales! ), reservations about the use of dodgy statistics by the Minister of Health in promoting his policy, objection that this policy was neither in the coalition agreement nor explicitly in the parties' manifestos and a real desire to ensure democratic input to the new system (as at present envisaged the lowest ranked elected person who can hear an appeal is the Minister). In an intervention, Bob Barton of Clwyd West put in a word for the people of North Wales who had to travel across the border for treatment and did not know how they would stand after the new arrangements in England. As Richard Kemp said in summing up (I paraphrase): the media expected blood on the walls, but instead witnessed a reasoned debate. The outcome was consensual, and by no means a concession to a Thatcherite minister. F4 on Disability Living Allowance - Mobility Component. This debate showed both how fast things were moving under the coalition and how much Liberal Democrats were influencing policy. Mover Mike Ward explained that the Conservatives had originally feared double payments and therefore made the cut to which this motion objected. But it was extremely rare for a local authority to include a mobility allowance as part of their care package. Pressure meant that the mobility component of Personal Independence Payments will not now be cut. Mike paid credit to disability organisations. But PIPs still assume that there are overlaps which need to be eliminated. There was a need to make clear that this assumption was unacceptable. He accepted the amendment and trusted that the motion would Influence the final outcome. The amendment was moved by ex-LibDem AM Mike German, now Baron German. He was co-chair (with Cardiff Central MP Jenny Willott) of one of the policy committees set up as a result of the coalition agreement. These also include a MEP and a member of the Federal Policy Committee. Mike’s committee of Liberal Democrats had put this unfair policy back in its box, but it was necessary to keep up the pressure. Bob Barton of Clwyd West, an old friend from WLD conferences, thought that the phrase “or other otherwise fund the mobility needs” in lines 21-22 was too woolly. Robert Adamson of Thirsk and Malton, himself a wheelchair user, said that his fellows should not have to bear more than their fair share of the pain. “After all, we’re disabled, not bankers,” he explained. The motion as amended was easily carried. from children in residential schools with effect from October 2012.
movement that is taken for granted by people who are not disabled. toiletries and mobile phones, there is normally no spare money to pay for transport. peers and may be prevented from enjoying family visits. mobility needs of those who cannot afford to do so themselves. Disabilities and the UN Convention on the Rights of the Child Article 31. The mover drew attention to the party’s tradition of supporting voluntary organisations. Suzanne Fletcher (Stockton-on-Tees) spoke of the need for democratic interaction with voluntary organisations as if people were dealing with those local authorities who had contracted the services out. Nick Watts (Chippenham), a first time speaker, as a redundant Network Rail worker was against lines 49-59, which called for . The message he was getting from his electors was that LibDem ministers had been supportive but fell in with ultra-Thatcherites when it suited them. Peter [Kunsman?] Kingston stressed the importance of lines 56-59. Although some valuable work was done by some religious groups, public services should be available to everyone who needs them regardless. Religions should not be able to opt out. Adam Kane of Clwyd West identified one cause of social exclusion as lack of access to finance & business support. This is something which [CDFIs] provide. But it was necessary that they be transparent. Prue Bray, speaking to lines 77-78, saw a danger of councils applying their own standards of management to voluntary organisations. If these were not treated with respect, they would walk away. Jackie Bell of East Lothian liked lines 41-48 as they encouraged green activities & sustainability. Lisa Smart welcomed lines 77-85, but queried the withdrawal of funding from Timebank which she thought embodied the spirit of the motion. Helen Flynn of Skipton & Ripon spoke of the need to consider equity & democracy in how the Big Society operates. She wanted to see adequate funding and to put clear blue water between us and our coalition partners. Only Simon Pardoe of Westmorland & Lonsdale was against the motion as a whole. He saw it as shifting decision-making from the council chamber to the golf course. Summing up, Baroness Liz Barker spoke of a range of issues faced by the [working party]. The people they were considering were a diverse part of our society from multi-million pound organisations to small neighbourhood charities. Labour had attempted to colonise the voluntary sector, while the Conservatives meant to use it as a weapon to attack parts of the state with which they disagree. The voluntary sector was at its best when working alongside the private & public sectors, though she saw a need to bring them into the mobile phone age. The motion was carried with only a few hands showing against. i) Community and voluntary organisations, by virtue of their independence, are a powerful means by which citizens can shape and change society. They unite people who are passionate about particular causes and in doing so they not only foster a sense of community and empower people to challenge the state and large corporations, but also counteract the disconnection and atomisation of today’s society. ii) A vibrant, independent community and voluntary sector, working alongside government and the private sector, enriches social, environmental and economic well-being. Government, national and local, must support the development and modernisation of voluntary organisations and social enterprises to inspire the next generation of active citizens. a) Supporting modernisation programmes designed to enable voluntary organisations to update their infrastructure, IT and business development skills and social networking skills. b) Simplifying regulation for charities, for example by standardising information reporting requirements and making the Charity Commission the sole regulator for both incorporated and unincorporated charities. infrastructure organisations to ensure that all charities have access to good practice. organisations and volunteers in statutory organisations such as school governors. c) Negotiating a UK-wide insurance package, available from major insurers, to provide comprehensive coverage for the vast majority of volunteering, local activity and celebrations. developing a network of Professional Services Working Groups across the country, so that voluntary organisations have access to services such as lawyers, accountants and architects. b) Working with a range of organisations to develop a new Community Benefit Index in which companies are encouraged to maximise their ‘community footprint’. a) Encouraging local authorities to provide advice and resources to schools, residents and tenants associations and other community groups to enable them to take an active role in managing open spaces to make them as attractive as possible for people and wildlife. b) Working with environmental NGOs to promote individual and community actions which take forward the green agenda in practical ways. a) Reviewing the implementation of the European Commission Directive 2004/18/EC to ensure that small charities are not being unfairly excluded and that the rules are being implemented with the flexibility which member states are entitled to determine. demonstrate how they will develop social capital. a) Setting up a series of initiatives, in partnership with the private sector, to promote digital giving. b) Modernising Gift Aid, by enabling online declarations and reclaims. a) Piloting programmes under which local authorities could act as guarantors for new local investment instruments, up to a specified limit. b) Establishing, in partnership with private investors, a high risk investment fund to enable innovative projects with the potential to transform the voluntary and community sector to be supported through early stage research and development. d) Encouraging a much larger community banking and community development finance institution sector, funded – as it is in the USA – by the big banks in lieu of the loans which they find it difficult to make to small business and social enterprises themselves. a) Engaging young people in designing new systems to incentives volunteering. b) Commissioning research into volunteering programmes to be run by small and medium enterprises. service units like schools, surgeries or housing estates also become volunteering hubs and catalysts, capable of using the resources that their users represent to reach out and rebuild local neighbourhood life and mutual support. The Welsh Liberal Democrat Assembly Member for South Wales West, Peter Black, has hit out at the announcement by Rural Affairs Minister, Elin Jones, today that she is to lay a fresh order to enable her to cull badgers in North Pembrokeshire and parts of Ceredigion and Carmarthenshire from 31 March. A previous attempt by the Minister was struck down by the courts on three grounds, namely that she had failed to properly define the area involved and thus did not reflect the consultation in the order, that the definition of substantial adopted by the Welsh Government set too low a threshold, and that there was a necessity to carry out a balancing exercise between the harm to badgers and the benefit to cattle. Mr. Black, who was a prominent opponent of the plan in the Assembly, said that the latest bid to initiate a cull could not be justified: “The UK government's study into bTB, which ran from 1998-2007 and was conducted by the Independent Scientific Group concluded that 'badger culling cannot meaningfully contribute to the future control of cattle TB in Britain'. Rather than suppressing the disease, killing badgers appears to spread it,” he said. “The Minister’s decision to introduce this order has been taken despite the fact that other measures she has taken appear to be working. The latest bovine TB statistics published on 18th February 2011 by DEFRA show a significant reduction in the number of cattle slaughtered in West Wales over the last two years. Between January and November 2010, there was a reduction in West Wales of 34% over the equivalent period in 2009. “Carwyn Jones is meant to be the leader of the Labour Party in Wales but his own MPs are now openly revolting against his government and his leadership. There will be many people who are now confused about who speaks for Welsh Labour – Peter Hain or Carwyn Jones. The Welsh Liberal Democrats will be using their opposition debate in the National Assembly this week to call on the Labour-Plaid Government to increase the use of personalised budgets for social care patients and scrap the ‘one size fits all’ current model. Veronica German AM, Welsh Liberal Democrat Shadow Health Minister, is calling for a radical change in social care to end the ‘one size fits all’ approach that ensures that many in Wales do not receive care packages appropriate to their needs. Instead, the Welsh Liberal Democrats will make tailored social care a priority in their election manifesto, using ‘personal care budgets’ to ensure that individuals can choose their own care package. Personal care budgets give people, and their carers, greater choice and control over the social care they receive. Users can tailor services to meet their specific needs. Welsh Liberal Democrats have also pledged to reform the regulations to give patients greater flexibility over what they can spend their care money on. “Social care is a vital service for many older, disabled and vulnerable people. It embraces the most intimate care and support for people at times of greatest need. How well we look after each other says a great deal about the strength and character of our society. “Often people in Wales find the social care system confusing, inflexible and not suited to their needs. That’s not good enough. Welsh Liberal Democrats want to offer more choice, control and flexibility over care. “Labour and Plaid have left Wales in the position where we are the worst nation for allowing people to pick their own social care. Although there is a direct payment system, take up is appallingly low and many are not getting the kind of personal care package that they need. “The Welsh Liberal Democrats will offer everyone receiving social care through the NHS or their local council the opportunity to use personal budgets so that they can chose the kind of care they need, when they need it. “Too many people are stuck receiving care that is just not right for them. Under Welsh Liberal Democrat proposals we will make sure that we change social care so that it treats people as individuals, offering them the dignity and respect they deserve. Last weekend saw the Welsh Liberal Democrats hold their Spring Conference at the Barceló Cardiff Angel Hotel in Cardiff. Yesterday, Dr Vince Cable introduced himself as the 24th most popular cabinet minister in a recent opinion poll of Conservative members - out of 24. "It is not something I lose any sleep over," he said. He went on: "It is a pleasure to be back in Wales today and it’s great to be able to return to a Wales that is so self confident and positive. “The ‘yes’ vote in the referendum means that the Welsh government now has the tools to do the job that is has requested and a new era of Welsh devolution begins. “The announcement earlier this week that the government will electrify the Great Western main line, improving journey times from London to Swansea, is positive news for the Welsh economy and evidence of the coalition investing in rail infrastructure where Labour failed in their 13 years in power. “Less commented upon, but also of huge importance will be the electrification of the Valley lines to Cardiff. “I am also pleased that the coalition government is now consulting on the possibility of making St David’s Day a public holiday, which itself could be a showcase for investment and tourism as well as a celebration of Wales’ national day. "Wales’ economic issues run deep and the impact of the loss of much of its manufacturing base in the 1980s is still felt. With the right support, we can establish the growth in the private sector that Wales needs. “Of course, not all of the economic levers rest in either Cardiff or London. It will require governments of different colours working together to rebuild the Welsh economy. “By setting out a clear plan to tackle Labour’s deficit, the coalition has headed off financial disaster and the basis for a revival in manufacturing is in place. “The policies that Kirsty Williams set out today, to focus relentlessly on the need to create new jobs and prosperity by investing in home-grown Welsh enterprises is exactly the approach needed in Wales and elsewhere. Dr Cable admitted that things were still bad on the national economic front, but progress was being made. A tax on bank balance sheets would consistently bring in more income than Labour's one-off levy on bonuses. An agreement had also been reached - not as good as Dr Cable would have liked, but still a major step forward - on the amount of money banks would be committed to lend to small and medium-sized businesses. Kirsty Williams: "A new era of devolution must now begin"
“I am delighted that there has been a ‘yes’ vote. It will make our law-making more efficient, it will save money and it will make it crystal clear where responsibility lies for decision making. The Welsh Liberal Democrats can be proud of the role we played in the cross party campaign up and down Wales. We can be particularly satisfied with the part we played in the areas where the Welsh Liberal Democrats are particularly active in area like Swansea, Ceredigion, Cardiff, Wrexham and Powys. “The result is clear and its legitimacy is not in doubt. “However, it is fair to say that the campaign has exposed widespread dissatisfaction with the performance of the Welsh Government which has presided over Wales becoming the poorest part of the UK, with standards in our schools and hospitals slipping behind England and Scotland. Kirsty Williams, Leader of the Welsh Liberal Democrats, has today welcomed the news that the UK Government will consult the Welsh Assembly over giving them the power to decide whether or not to move the Early May Bank holiday to coincide with St David’s Day on 1st March. Welsh Liberal Democrats have long campaigned for St David’s Day to be a bank holiday so that the people of Wales can celebrate their culture and heritage. Mark Williams, Welsh Liberal Democrat MP, held a debate in the House of Commons on Tuesday arguing that the Welsh Assembly should be given the power to designate St David’s Day as a public holiday. In 2000, the Welsh Assembly voted unanimously in favour of making St David’s Day a public holiday, but the Labour Government in Westminster would not give the Assembly Government the power to designate a public holiday on 1st March. The Scottish Parliament voted to make St Andrew’s Day a public holiday in 2006. “This is great news for Wales. A St David’s Day holiday would be a great opportunity to showcase our culture and heritage, making it a global festival of all things Welsh and a showcase for investment and tourism as well as a celebration of our national day. This will be a day to celebrate our culture and promote economic activity like the Irish do. “I have been pushing very hard for this with the UK Government. Labour had 13 years to deliver this but never did. “The Welsh Liberal Democrats have been campaigning for a bank holiday on St. David’s Day for a long time and I am very happy that the UK Government is going to consult with the National Assembly over giving them the power to decide whether or not to move the Early May Bank holiday to coincide with St David’s Day on 1st March. The Welsh Liberal Democrat Assembly Member for South Wales West, Peter Black, has expressed his disappointment that today’s announcement on the electrifying the main line from South Wales to Swansea has stopped short at Cardiff. Mr. Black was commenting on the statement by the Transport Minister this afternoon that he was proposing to invest in electrifying the Great Western mainline from London to Cardiff and in new trains to run from London to Swansea. “There is no doubt that even though electrification will not continue all the way to Swansea, passengers travelling to and from the city, Neath, Port Talbot and Bridgend will gain from new rolling stock and faster journey times,” said Mr. Black. “However, it remains a disappointment that we will not be benefiting from the full electrification project. This decision sends the wrong message to business investors about the South West Wales economy. “Nevertheless, this is still a significant step forward from the position left by the previous Labour Government. Gordon Brown announced an electrification project in 2009, saying that work would start immediately but nothing happened. Not only did Labour fail to put aside any money to pay for the project, they had not carried out the detailed technical work needed.